Home / Articles and Stories by Njkinny / Articles by Njkinny / Product Review / #WebsiteReview: Blogmint ~India’s 1st automated platform that connects brands and bloggers! #WebsiteReview: Blogmint ~India’s 1st automated platform that connects brands and bloggers! Blogmint says it is India's 1st automated platform that connects brands and bloggers and I agree. I cam to know of Blogmint through Facebook when I saw their post about Harsha Bhogle's #BloggerDreamTeam contest. I registered here and voila! I was introduced to this magical platform named Blogmint. Once you register, you need to create your profile and then you are free to apply for the various campaigns listed on the website and if you get selected, can write on the given topics and get paid! Apart from connecting bloggers to brands, Blogmint also provides very in-depth analytics which help us know our weak points and improve on them. Everything from creating your profile to applying for campaigns based on your interest to writing about them and getting paid, is transparent and done in a most professional way. I am very happy to have connected with Blogmint and can truthfully say that it is fun and a happy experience which not only gives us, Bloggers, more exposure and a chance to write for our favourite brands but also gives us a simple and effective medium to earn some extra money. Bloggers follow these simple steps on Blogmint to connect with brands and earn. 1) Open the website and click on register. 2) Follow the step by step process and at the end you get yourself a full profile complete with your bidding prices for writing a single blog post and also creating a video. You can give any amount depending on your popularity and reader engagement strength. You also get detailed analytics of your blog along with a Blogscore which is measured on your social presence, blog's performance and blog's global benchmarking. This Blogscore keeps updating along with the improvement of your blog. 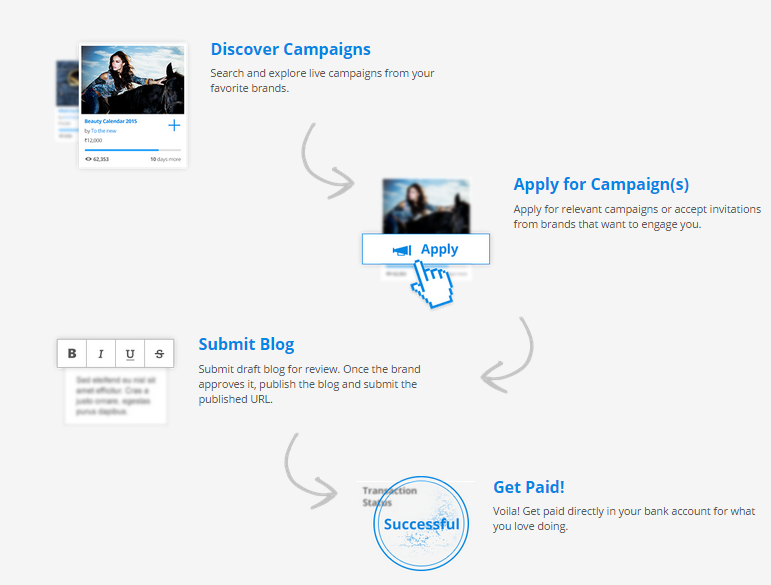 3) Click on "Discover Campaigns", present at the top and checkout the new campaigns and "apply" based on your preference. 4) If selected, you will get a mail and also a notification on Blogmint. 5) Get the full details from the brand. Go checkout the website and register. 1) The major aspect that needs to be worked on is their response to queries and questions. I have seen that we need to shoot multiple mails and then sometimes also contact them through social media to get the team's attention which is sometimes very frustrating. 2) Once a work order is completed, often there is no clear intimation on when the payment will be made which again needs to be improved. Clear timeline should be given on the website regarding the time limit of payments for respective campaigns so bloggers don't have to contact the Blogmint Team with queries. I hope they work on these pointers and make Blogmint more efficient and better. Have you tried Blogmint? Do share your experiences with me in the comments section. I love hearing from you.